Vegetarian stuffed peppers seemed like a necessary addition to our meal rotation, since my Greek Stuffed Peppers have been a long-time favorite of all of my boys. And since I seem to be on a vegetarian vegan streak in the last two weeks (Vegan Spring Rolls and 15 Vegan Dinner Recipes are Exhibits A and B), I thought I’d continue the trend. This meatless and gluten free recipe can be easily varied depending on your tastes and pantry staples. More suggestions below! 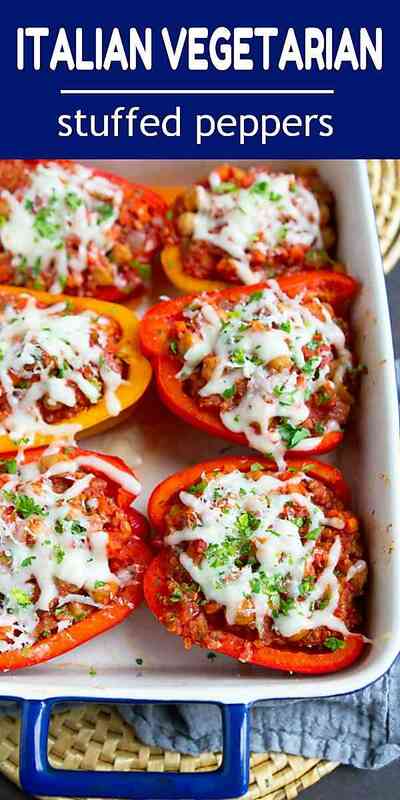 Making these meatless stuffed peppers is similar to making versions with ground turkey or beef (see more details in the next section), with a couple of small changes. In place of meat, use some sort of cooked legumes, such as lentils or beans. I opted for chickpeas in this Italian-inspired recipe, but I’ve also made them with cannellini (great northern) beans, which works equally well. Feel free to switch up the grain to suit whatever you have on hand. I chose to use quinoa because it cooks quickly and I often have packages of cooked quinoa in the freezer. Other options are brown or white rice (classic ingredient), farro and barley. First step? The peppers, of course! 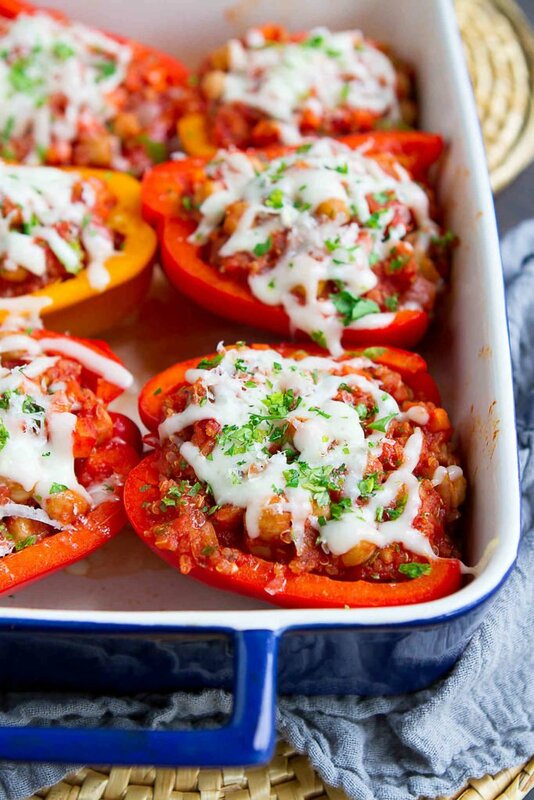 The classic stuffed peppers, at least when I was a kid, were made with green bell peppers. However, many people (my family included), aren’t on board with green peppers. Sweet bell peppers of any color work really well! Cut out the core of the peppers, cut in half lengthwise and remove any seeds or membranes. A 9- by 13-inch baking dish has enough room to fit the six pepper halves in a single layer. 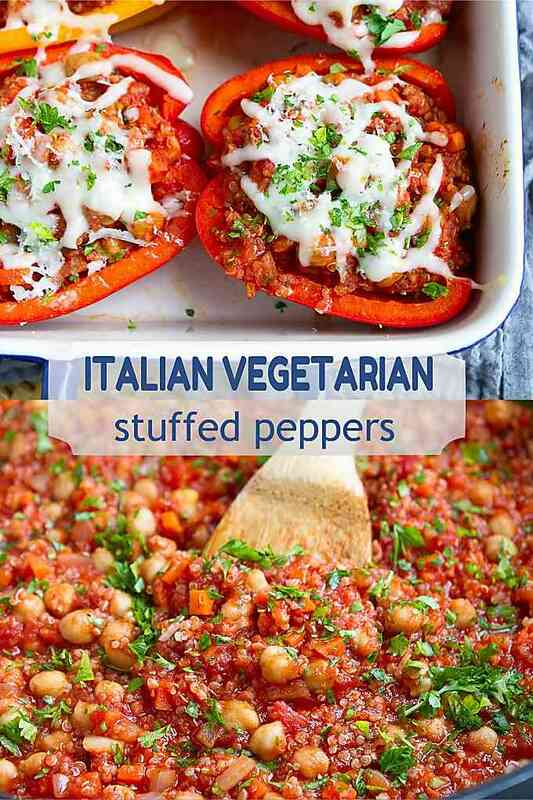 While there are stuffed pepper recipes available that involve cooking the raw meat (if using meat) directly in the pepper, I vastly prefer to cook it in a skillet with the base veggies (onions, carrots, garlic). That way you can discard any liquids – fat or water – and insure that the meat cooks evenly. While some people swear by cooking the grain (rice, etc.) in the pepper, this has never worked for me. Instead, cook the grain separately and stir it into the skillet with the beans/meat, tomato sauce and vegetables. Taste your filling! Before transferring the filling to the peppers, taste it and adjust the seasonings. The filling is where most of the flavor comes from in this dish, so you want it to be just right. Once the peppers are stuffed, pour some water into the bottom of the baking dish, cover the dish with foil and bake until the peppers are tender. In this method, the peppers steam in the baking dish, so there’s no need to blanch them ahead of time. Top with cheese and bake, uncovered, for an additional 5 minutes. 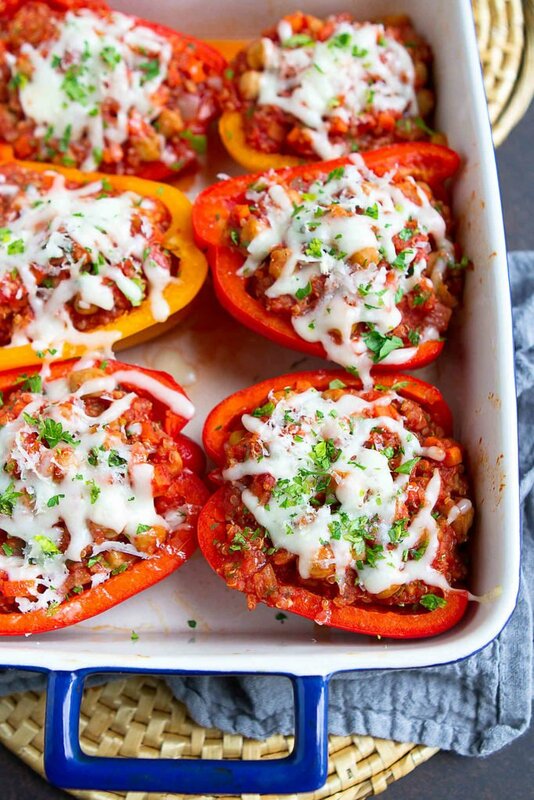 Can stuffed peppers be made ahead of time? Yes! Cook the filling and stuff the peppers up to one day ahead. Cover the baking dish with plastic wrap and refrigerate. Before baking, remove the plastic wrap and tightly cover the dish with foil. It may be necessary to add about 10 minutes of cooking time for the filling to be hot enough since it’s coming straight from the fridge. Leftover can be stored in the refrigerator for up to 3 days, then reheated in the microwave. Heat the olive oil in a large nonstick skillet set over medium heat. Add the onions and carrots. Season with ¼ teaspoon salt. Cook, stirring occasionally, until softened, about 5 minutes. Stir in the garlic, Italian seasoning and red pepper flakes. Cook for 1 minute. 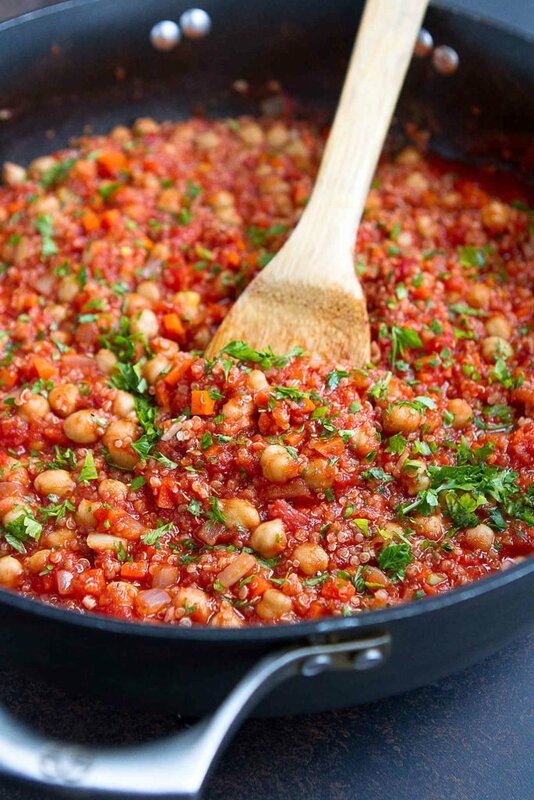 Add the crushed tomatoes, chickpeas and remaining ¼ teaspoon salt, bring to a boil, then simmer for 10 minutes. Remove from the heat and stir in the cooked quinoa and 3 tablespoons parsley. 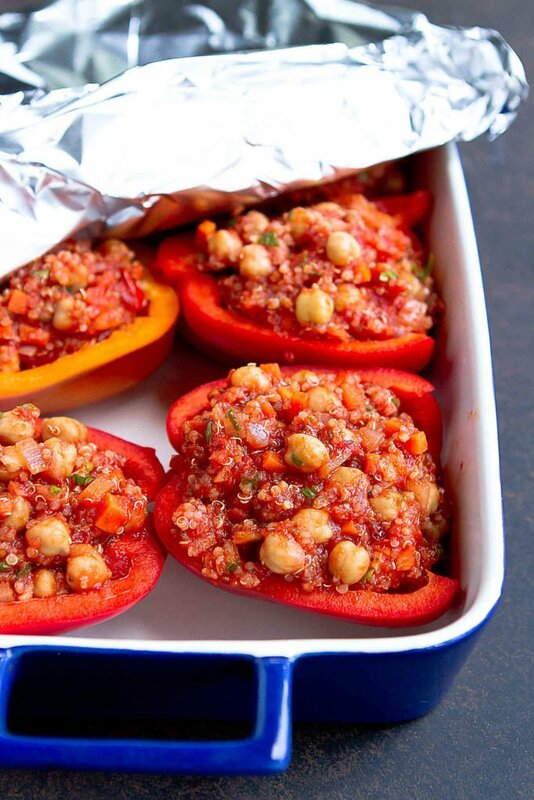 Place the pepper, cut side up, in a large baking dish. Divide the chickpea mixture evenly between the peppers. Pour ½ water in the bottom of the baking dish. Cover tightly with foil and cook until the peppers are tender, about 30 minutes. Sprinkle the mozzarella cheese and Parmesan cheese over each pepper. Bake, uncovered, for an additional 5 minutes. Garnish with remaining 1 tablespoon of parsley. Serve. Mmm… I think I just heard my tummy growl. lol. Thank you for making me hungry! Tried it today and it was phenomenal. Very flavorful and easy to make! Plus we loved the bright colors!